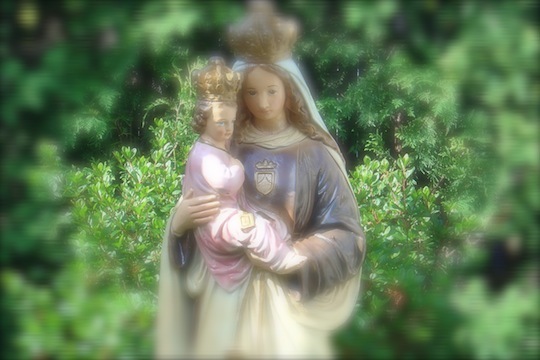 Today is the feast day of Our Lady of Mt. Carmel. Joni Mitchell once expressed in her lyrics, "All romantics meet the same fate someday. Cynical and drunk. And boring someone in some dark café." This vision of love lost seems inevitable. The decline from the naïve, to the sophisticated, to the simply cynical; as reason and reality crash into love and romanticism. This seems like an unwritten and inescapable law of nature. An unavoidable path that destiny leads us along. Joni replies to her disillusioned friend, "Richard, you haven't really changed. It's just that now you're romanticizing some pain that's in your head"
The romantic spirit never dies, it finds a new ideal to place up on a pedestal and worship. We are made to worship, to adore. We seek out an object of affection that we can idealize and pour all of our love into. Our undying affection. Without that our lives are empty. And to quench the fire that rages through our souls we seek out diversions. And we manage to temporarily stop the spreading flames, but new sparks ignite new flames. And so we engage in a never ending internal battle. The one balm that could heal us is the one that we have tossed aside. A voice inside us hisses, "Why such a cure is nothing but an old superstition. There is no scientific evidence that it can heal – never mind perform miracles – as claimed by the religious zealots." "And besides," we tell ourselves, "we are not sick. We are perfectly healthy. There is no need for a remedy." A chorus of voices from within affirms this sentiment saying, "The 'pain' that you feel is purely psychological. In the mind; not the heart; not the soul." But deep within us a child cries out, "Father! Father!" And the Father replies, "Here I am my beloved child. Come to me." + St. Teresa of Avila, you showed us how to pray; you showed us the Trinitarian Love that resides within each one of us. Pray for us. + O Lady of Mt. Carmel, show us your son. Make us worthy of His promises. Amen.